In this sixth installment of The Lawson Brothers Series, Marquita Valentine whips up a Love So Unexpected. Caleb Lawson, the second oldest Lawson brother knew what it meant to lose someone you love so tragically. Thirteen years ago, Caleb watched his wife die from a tragic car accident and ever since then he has dedicated his life to the family's farm. 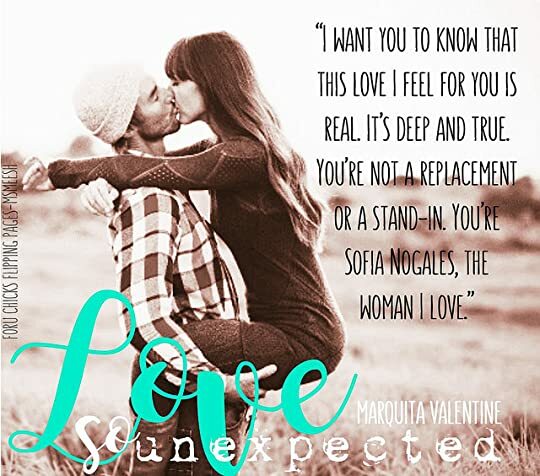 He never thought he could be open to love that is until Sofia Nogales walked into his life. As a former head chef, Sofie wanted to start anew and so she packed up all her belongings and started her trek to the east coast. But a series of unfortunate events had Sofie making a pit stop in Jessamine, North Carolina where she was greeted with her mother's college roomate, Dinah Lawson. Dinah decided to host Sofie temporarily till Sofie could land a job and can get back on her feet. Sofie didn't intend to stay long in Jessamine that is until Caleb Lawson gave her reason to stay. Right off the first meeting,Caleb and Sofie instantly hit it off. For the first time in thirteen years, Caleb finally let his guard down and was ready to take a chance with Sofie. As Caleb and Sofie begin to developed deep feelings for one another, how will Caleb react when he discovers that Sofie has a job offer in Atlanta? Will Sofie take this dream job offer? Or will she choose the man who showed her what it meant to have a home? Love So Unexpected was definitely your quick light sweet charming romance that I thoroughly enjoyed. It was your feel good family romance that will leave a smile on your face. So if you are looking for a drama free and sweet romance, then I would definitely recommend you to read this book.